Since President Donald Trump took office nearly two years ago, some 4.8 million new payroll jobs have been created. That’s more than four times as many as created during President Obama’s first four years. Hold on, you say, didn’t the unemployment rate jump from 3.7% to 3.9%? It did. Yes, but not because more people were unemployed, but because more people entered the labor force, seeking opportunities that didn’t exist before. It’s actually a bullish sign. Some 419,000 people entered the workforce during the month, driving the labor force participation rate to 63.1%, up from 62.7% a year ago. That bellwether employment figure declined pretty consistently during the job-poor Obama years, from 65.7% when Obama entered office to 62.9% when he left. It stabilized under Trump. Last month’s 63.1% tied for the highest point since September 2013. This rapidly improving economy is the result of President Trump’s deregulation and tax cuts. Cutting the corporate taxes and regulations resulted in manufacturing jobs returning to America (after President Obama told us they were never coming back). So why is the Democrat House of Representatives trying to undo this progress? Are they simply economically badly informed or is there another motive? Well first I would like to mention my favorite Milton Friedman quote, “If you put the federal government in charge of the Sahara Desert, in five years there’d be a shortage of sand.” I think there are two forces at work here–first of all the Democrats love taxes. They believe that the more of everyone else’s money they have to spend, the more powerful they are. Second of all, Democrats with brains realize that increasing taxes will slow economic growth. Slowing the Trump economy is the only chance the Democrats have of taking the presidency in 2020. That is the plan. Hopefully the Senate will not pass the House of Representative’s budget plans. They will be harmful to average Americans. President Trump has helped average Americans economically. President Obama helped Wall Street but ignored Main Street. The House Democrats seem determined to go back to that model which ignored average Americans. The DOW daily closing stock market average has risen nearly 14% since the election on November 8th. (On November 9th the DOW closed at 18,332 – on May 19th the DOW closed at 20,804). 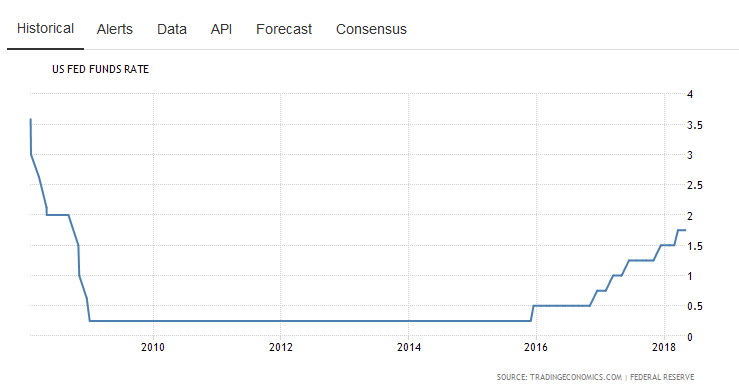 * The US Stock Market gained $2 trillion in wealth since Trump was elected! Somehow this news has escaped the mainstream media. The article goes on to list job statistics and home sales statistics. I strongly suggest that you follow the link to read the entire article. President Obama left President Trump with a weak economy and all sorts of domestic and foreign policy nightmares. To date President Trump has had little time to address all of these messes but if he handles these as well as he has the economy Americans will soon be in a much better and safer place. Overall based on the above data it is clear that President Trump is doing a solid, if not excellent job. 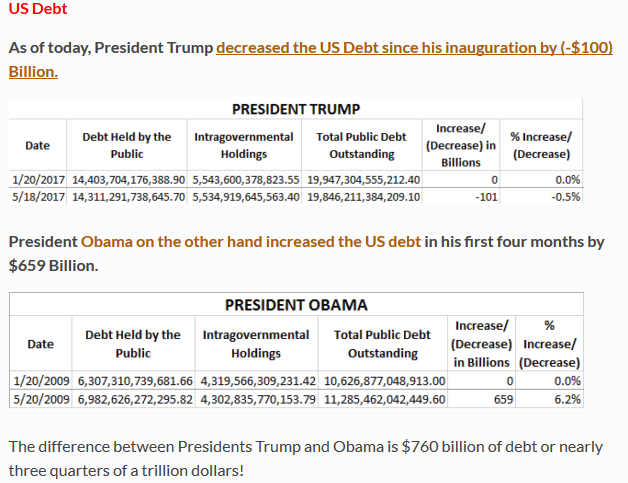 The mainstream liberal media won’t report this, but when looking at the economy, President Trump the businessman thumps the former community organizer Barack Obama. Despite what the media is telling us, this does not sound like a White House in chaos. It sounds like a White House that is getting the country back on a solid economic footing despite tremendous opposition from the media. The March Jobs Report was released today. Breitbart posted the numbers. The United States created 98,000 jobs in March, and the unemployment rate dipped to 4.5 percent, the Bureau of Labor Statistics reported Friday. 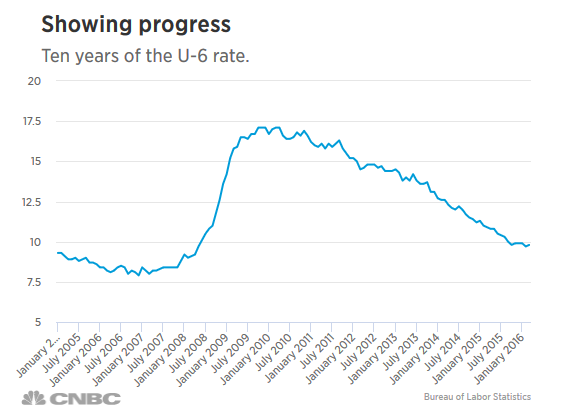 The number to watch is the Labor Force Participation Rate. That number has remained steady. It needs to go up, and I suspect that it will in the coming months. It is my belief that as President Trump begins to remove the regulatory burdens from American industry, the Labor Force Participation Rate will increase. That will be the evidence that we are finally recovering from the recession that we entered eight years ago. The original recession was not the fault of President Obama, but the actions he took during his administration were not actions that were going to facilitate a strong recovery. On Friday The Washington Free Beacon posted an article about the latest workforce participation rate. The number of Americans either working or looking for work in the past month hit a record high of 160,056,000, the first time this number surpassed the 160,000,000 mark, according to numbers released by the Bureau of Labor Statistics. Last month, there were 159,716,000 Americans in the labor force. There were 340,000 more Americans who joined the labor force in February, while 176,000 left. The number of Americans not participating in the labor force declined from 94,366,000 in January to 94,190,000 in February. The bureau counts those not in the labor force as people who do not have a job and did not actively seek one in the past four weeks. The labor force participation rate, which is the percentage of the population that has a job or actively looked for one in the past month, increased from 62.9 percent in January to 63.0 percent in February. 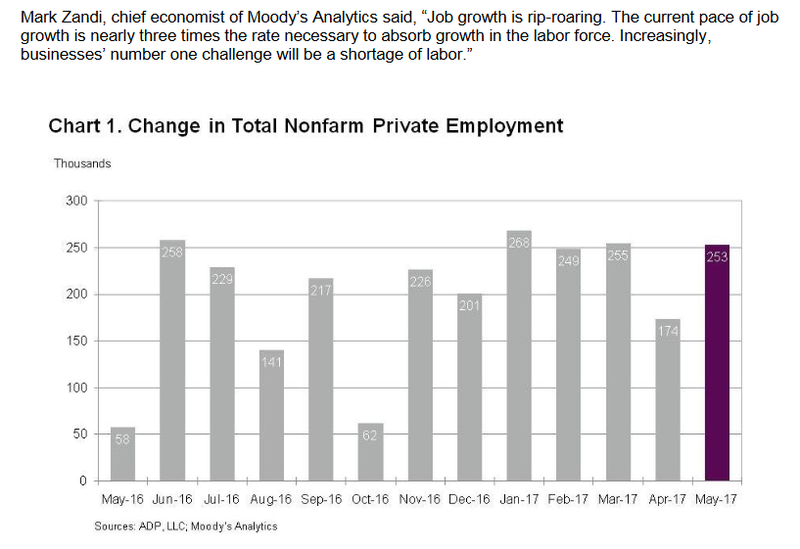 Because the number of unemployed also went down, the unemployment number also went down from 4.8 percent in January to 4.7 percent. The “real” unemployment rate, otherwise known as the U-6 measure, was 9.2 percent in February, which declined from 9.4 percent in the previous month. This is the true unemployment number, and it needs to continue to decrease.